Brides who love to sparky on their wedding day have a choice of a choice of sparkling wedding dresses. These dresses shine like diamonds and flash brightly under the moonlight. The glitters may be gold or silver which is made of fine beads, sequins, metallic colors amongst other adored decorations. Such decorations can be added to both the current wedding dresses and vintage wedding dresses. It is advisable to keep your accessories simple when you wear this kind of dress. These exclusive dresses will do the talking for you. Ladies have challenges getting the right dress for their occasion. Despite the bride may have an idea of the choice of dress she needs, picking it from the shelves is difficult due to other good products. Sparkly dresses attract from far and the bride needs to know all the details she needs on her dress. Elegant beadwork cannot go unnoticed. The silver or gold makes the dress compete more in the market. Find a dress that has the best combination of beads that sparkle. 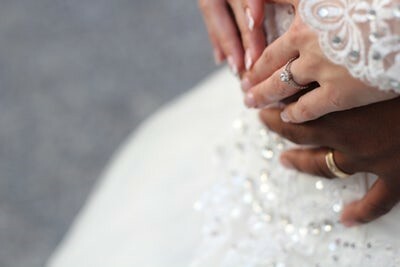 Gold and silver colors are common in weddings. They don’t only look sparky but also elevates the class of the dress. Girls wanting to look classy and expensive can go for this type of dress. It shines under the sun and moon, therefore making it the ideal dress for both day and night weddings. Keep your budget realistic. Some of these stones and metals are expensive. You should factor in alterations, shipping, and tax charges before purchasing the dress. Plan ahead and pay in advance for the dress. Keep all records of purchase for any eventualities. It can look awkward when the bride shy off from the crowd on her wedding day. Sparkly dresses are very attractive and therefore most of your guests will admire you for the entire wedding session. You should know how you look in your dress days before. You can sit, dance or walk up and down to know how it feels. If there are necessary adjustments to make, let them be done by a professional tailor. Don’t get overwhelmed by the many sparkling wedding dresses available in the store. However, do not stick on to one choice. What is appropriate for one bride may not be good for you. Remember this is your wedding and you should look according to your choice of style. It is advisable the bride keep a low profile of the accessory when wearing a sparkly dress. The hair and makeup should also be kept at a minimal level. However, sparky shiny shoes on this day are a good combination. This category of dresses has stiff competition from the standard white wedding dress. Therefore, buy a dress that fits you well and has sparkles that combine well with your skin color. The entire bridal party should not look shiny not to steal the show.